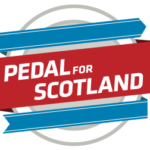 Pedal for Scotland returns for our 19th year on 9th September 2018. Pedal for Scotlands main event day will feature the 45 mile Classic Challenge from Glasgow to Edinburgh. The Big Belter is a colossal 100 mile ride from Glasgow to Edinburgh using the first 20 miles of the Classic Challenge route. The Wee Jaunt Edinburgh will take on the last 10 miles of the Classic Challenge route, from Linlithgow to Ingliston.